I have problems reading Dickens. His novels are too long, with too many caricatures. I find I have to watch a TV adaptation before I can make a start and then I have to read according to a schedule dictated by the original installments. Then, and only then, does a Dickens novel work for me. There simply wasn’t time for that within the timeline of the current Classics circuit. Hence my choice of The Memoirs of Joseph Grimaldi. At 350 pages, it’s must shorter than an average Dickens and as a piece of non-fiction, it doesn’t have the huge cast of characters. But it is still a curiosity. Joseph Grimaldi was Britain’s most famous clown – the man who put P into pantomime. He trod the boards from early childhood until his health-related premature retirement. He was a national sensation. He worked hard, made a lot of money and lost most of it not through dissolute living but through poor investment. He was a decent man – his philosophy being never to refuse help to a human being when it was in his power to do render aid. His life was not without trials though the tears of this particular clown were mostly reserved for his final years when his talented only son followed him onto the boards and transmuted into a 19th century Richard Harris. Grimaldi’s retirement led to reduced circumstances also and it was these that led him to write his celebrity memoirs, starting a trend that prevails to this day! Except a) he never lived to see them published and b) they weren’t very good, even after they had been rewritten, revised and corrected by the journalist, Thomas Egerton Wilks. When a young Dickens was asked to rework them in 1837, he wasn’t very keen. He considered them redolent of twaddle and was so doubtful that he could make a silk purse from this pig’s ear that he demanded a £300 advance without any reference to sale. His terms were accepted and he reworked them in just two months. The Grimaldi grows under the alterations much better than I supposed possible he opined. After many months of hope, and some of fear, and many lingering changes from better to worse, and back and back again, his dear wife, whom he had loved from a boy with so much truth and feeling, and whose excellences were the old man’s fondest theme to the last moment of his life, many years afterwards, died. What? She died – just like that? I think this text would be of greater interest to a Dickens aficionado (as it is apparently similar in style to The Pickwick Papers) or to a historian specialising in the form and content of contemporaneous Victorian memoir. I found myself referring frequently to Andrew McConnell Stott’s The Pantomime Life of Joseph Grimaldi to fill in a detail here and there and inject some life. Published in 2009, Stott’s book is the Winner of the Royal Society of Literature Jerwood Award, Sheridan Morely Theatre Book Prize and George Freedley Memorial Award. It confirms that there’s a good story in Joseph Grimaldi’s memoirs; it’s just that 19th century convention prevented Dickens from telling it with the detail that is appealing to a 21st century general reader. Go on judge for yourself. Which style do you prefer? a) or b)? Of the incident which sent the relationship between Grimaldi and his son into a downward spiral …. a) Young Joe had received a severe blow on the head from a staff, which crushing his hat, alighted on the skull and inflicted a desperate wound. It is supposed that this unfortunate event disordered his intellects, as from that time, instead of the kind and affectionate son he had previously been, he became a wild and furious savage. b) It all began with a blow to the head that would open the vents of hell. 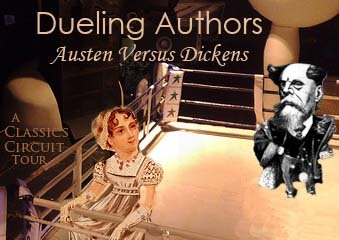 This post is part of the Classic Circuit Duelling Authors: Austen vs Dickens tour. I would have chosen to read Austen if I had any of her finished novels left to read. From her oeuvre, I reserve my snark purely for Emma, whereas I am snarky abot Dickens almost all the time. I bear the scars of ploughing through David Copperfield when I was too young. I do not like Great Expectations – can’t stand Pip or Estella and the novel is simply painful to read when you couldn’t give a toss about either of the major characters. Yet, if ever consigned to the proverbial desert island, I’d make space in my luggage for Bleak House and for Pride and Prejudice only if there was room left over. Which fact, against all odds and form, means that Dickens has just delivered the knockout blow. Previous Previous post: 200,000 hits – Let’s celebrate with some new books …. for you! I had never heard of this book – I had no idea that Dickens was a ghost writer. The Stott book sounds great – I’ll look out for it. I am reading the Grimaldi biography and fail to see how you could find it a tad dull. It has Dickens’ signature stamp of theatrical dialogue, though is devoid of the showy language that Dickens sometimes uses, and the details of Grimaldi as a boy, being beaten by his father, his father feigning death – to see what his kids really think of him – his daughter severing her fathers head to ensure he was really dead and not buried alive, are salacious enough; the case of Grimaldi using a “piece of tin” to pay for a pub lunch, the boy Grimaldi collecting ‘blue’ butterflies and presenting them to kings and courtiers bring to life London at a particular time in the same manner as Nicholas Nickleby and Oliver Twist. If you are talking of movies the 1960’s movie of Nicholas Nickleby is a tidy enough affair, though leaves out many of the very funny scenes and characters for example. However, the movies were definitely the starting points for me and I would never have tackled the novels when I was a lot younger. Their length and language would have put me off as well as the fact that he was so popular. Now I can see what all the fuss was about.